Increasing regulatory pressures on healthcare organizations have created a national conversation on data, reporting and analytics in healthcare. Behind the scenes, business intelligence (BI) and data warehousing (DW) capabilities are key drivers that empower these functions. 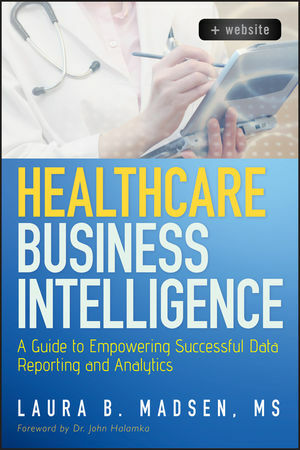 Healthcare Business Intelligence is designed as a guidebook for healthcare organizations dipping their toes into the areas of business intelligence and data warehousing. This volume is essential in how a BI capability can ease the increasing regulatory reporting pressures on all healthcare organizations. The risk associated with doing BI/DW wrong is high, and failures are well documented. Healthcare Business Intelligence helps you get it right, with expert guidance on getting your BI program started and successfully keep it going. LAURA B. MADSEN, MS, is founder of the Healthcare Business Intelligence Summit and international keynote speaker on healthcare BI. She brings more than a decade of experience in BI and data warehousing for healthcare. Laura leads the Healthcare Practice for Lancet, a leading BI consulting firm headquartered in Minneapolis, Minnesota. At Lancet, she spearheads strategy and product development for the healthcare sector and works with key accounts across the country in the provider, payer, and healthcare manufacturing markets. Prior to joining Lancet, Laura held senior positions with several leading healthcare companies, including UnitedHealth Group. Her responsibilities included leading an enterprise BI project from pre-concept to execution, managing a commercially available suite of BI tools, and advising both business and IT leaders on effective healthcare BI practices.